Here is the first harvest from the balcony this year. 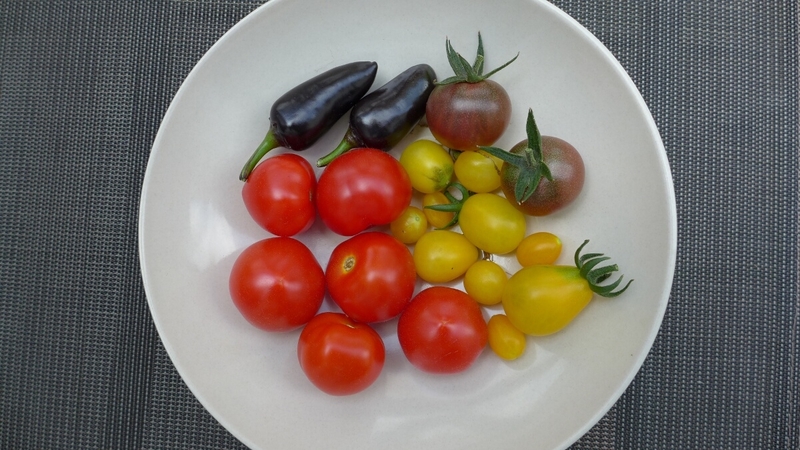 The tomatoes are the same kinds as of last year’s season – Rutjes (red), yellow date and purple cherry tomatoes. The black jalapenos came from the same plant as last years as it moved into our living room for the winter. 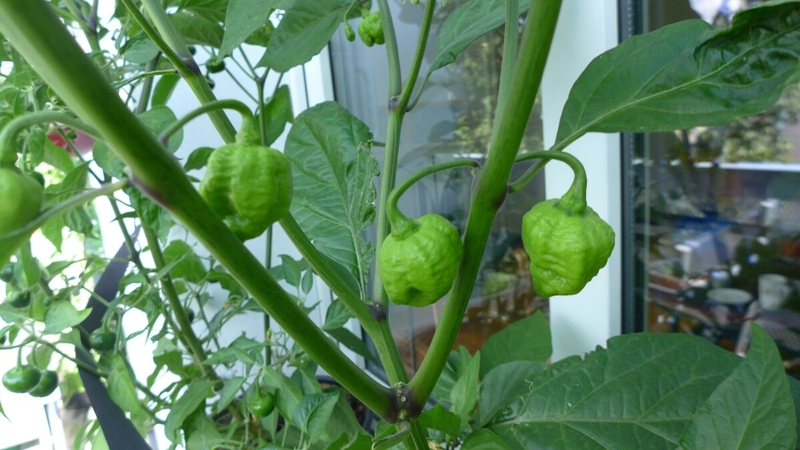 New this year are two chili plants – Bhut Jolokai and Trinidad Moruga Scorpion, the two hottest chilis currently known. I am pretty sure they will be too hot for us to enjoy, but I wanted to grow them at least once. Both plants have currently about 10 green chilis on them. That will be more than enough for the next years. 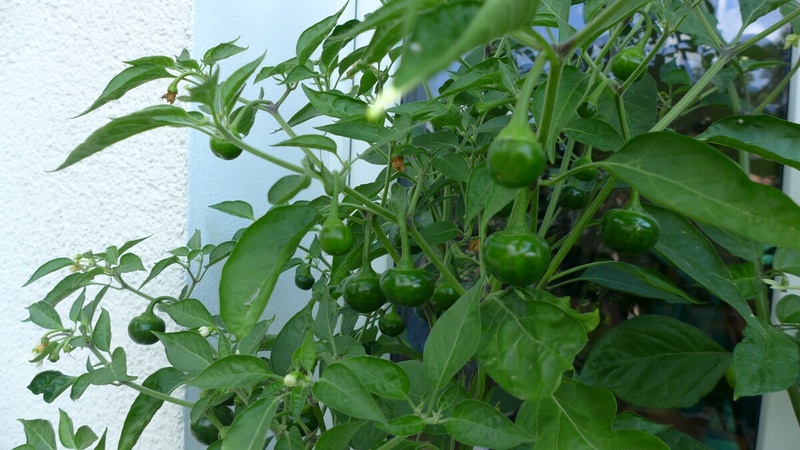 Here is picture of the Scorpion chilis, they already have the typical coarse and rough surface. I started planting the seeds for the chilis already in late January to give them a head start and use the rather short summer in Berlin as good as possible. However, the Bhut Jolokai and Scorpion seedlings stayed very small for the first 3 months. Only the Aji Cereza (still my favorite chili) plant started growing right away. After being concerned that the seeds may not have been of good quality, they finally started growing very well from June on. 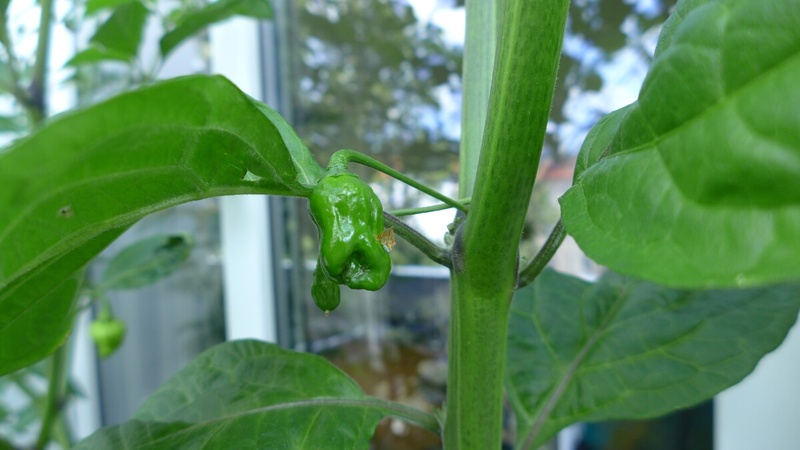 Hopefully the weather stays sunny and warm to give the plants enough time for ripe chilis.